When a patient is missing a single tooth, the tooth can be replaced with a titanium root - like dental implant. 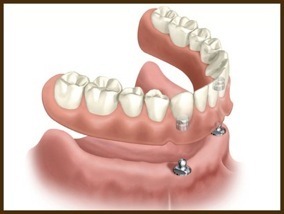 Implants can be used to make existing or new dentures fit securely to your mouth. The dentures simply clip into the implants and can be removed with ease when required. If a patient is suitable biologically, Implants can be a solution to complete transform a removable denture into an Implant bridge that can be screwed into 4 or more dental implants.